Today was a special day. We visited the Petrified Forest National Park. We have visited a few other National Parks across our great country but would come away a bit underwhelmed. There may be several reasons for this. First ,we're of the Disney World generation. We are used to being awed, then quickly moving to the next line to be awed again. When we visited Old Faithful at Yellowstone National Park a few years ago we sat on a bench for almost an hour for it to erupt. When we stayed at the Wilderness Lodge in Disney World, Old faithful went off exactly on the half hour. Another reason is related to Disney as well. Most National Parks are huge. It took us a full day to drive around Yellowstone and we only made a couple of stops. Do you think we really got to know and understand Yellowstone? Not hardly. At Disney you can 'walk around the world' in just a few hours at EPCOT. One of the lessons that we've learned on this trip is you have to slow down and take the time to really appreciate what's there. With this in mind we were ready to see the Petrified Forest. Oh, one more thing. We had a personal guided tour today. And I mean for the entire day. Complete with dinner afterwards. Our friends Bob and Linda are volunteering at the park during March and April. And they had graciously invited us to see the park on their day off. They had also arranged for someone to show us some behind the scene stuff as well. We met at the visitors center at 8:45 and after hugs all around they introduced us to Scott, who is one of the curators. Scott has an interesting job. One day he might be cataloging pottery and the next he might be preparing an exhibit of petrified wood. Petrified Forest N.P. is a 28 mile long corridor made up of 3 distinct areas. The north end which is located off of I-10 has a visitor center and the Painted Desert. The area in the middle is where a large numbers of artifacts have been found from a native people who lived there around 700-900 a.d. The south end is where the petrified wood is found. 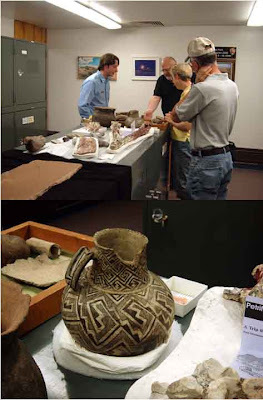 Scott showed us some samples of pottery discovered in the middle area as well as some very special wood from the southern area that is not on display. He also explained the various layers and formations that make up the painted desert of the northern area. Then it was time to get in the car and hit the road. Another great thing, I didn't have to drive today. Our first stop was at Pintado Point in the Painted Desert then we headed down to the south end of the Park. This is where the original park entrance was built by the C.C.C. If you don't know what that is, you're probably too young and should look it up. Before we knew it, it was time for lunch. Linda had suggested we each bring a picnic lunch along. As we ate our lunch we got a chance to catch up with each other on our travels over the last couple of months, and then it was time to head on. 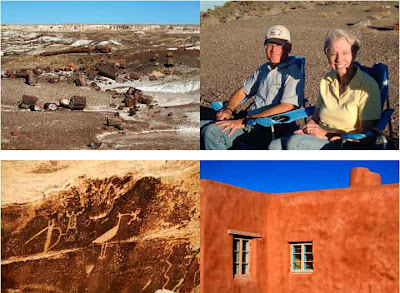 We made numerous stops along the way to view petrified wood, petroglyphs, and ruins. The weather was sunny 70's and the company great, so time passed very quickly. By the way, if you are thinking of taking even a small piece of petrified wood out of the park, I have one word for you... don't. It's a federal offense and they don't kid around about it. Bob had his Park Ranger radio with him and we heard radio conversations regarding some people who were trying to leave with a few samples. It's not real smart because there are only 2 ways out of the park. I could go on and on but let me just say it was a great day. After visiting the Painted Desert Inn which was part of the original Route 66, Bob and Linda said it was peanut time. If you have read their blog you know about this daily ritual. It happens around 4:00 pm and it's their way of celebrating another great day. 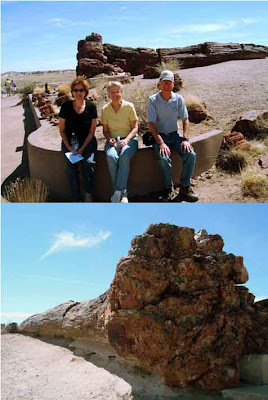 As you can see in the pictures, we ate peanuts on Chinde Point overlooking the painted desert. It was a little breezy, but a perfect way to end our tour. But our day was not over yet. Bob and Linda had invited us to their RV for a grilled shrimp dinner. Back in February, they caravaned to Mexico in their motorhome with 20 other adventure seekers. They brought back some very large, fresh off the boat shrimp. After a glass of wine and appetizers it was time for dinner. Bob grilled the shrimp and some sweet potato and Linda had made a tomato salad and coleslaw. And the perfect end to this great meal was a piece of Linda's chocolate zucchini cake and a glass of port. Now I ask you, can it get any better?? As we drove back to our RV under a star filled sky we both agreed it had been a very special day. Thank you Bob and Linda. We look forward to the day our paths cross again. P.S. We realize not everyone can get a guided tour like we had so here's our advice. Read all you can about the Park before you get there. Allow twice as much time as you think you'll need. Ask for help. The rangers and volunteers love to help. Take advantage of the special tours and guided walks. We noticed there were at least 4 guided tours available at no additional charge. Slow down and soak it in. This is not Disney, but it is our history and heritage. Enjoy it. We had a super day too! Love you guys. Safe travels!